The gauge requirements for Sock Wars III were released on Saturday. I worked the weekend (so I would not have to work on MSWF weekend) and appreciated the gentle reminders from Maria and Al that the gauge had come out on April 26th. At any rate, the gauge is 8 sts per inch, not a big surprise, but a challenge for me to achieve. I typically do not knit sock gauges, or as Rita Buchanan would say, I knit size a 8 1/2 sock as my gauge square. As I searched for my size 3.0 mm Knit Picks 32 inch circular needles, I came across this pattern for a Mini-sock. I would use it when I taught sock knitting classes, especially to show the grafting technique. 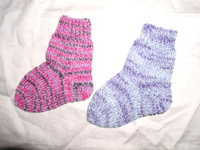 I knitted the sock on the left with my 2.5 mm Knit Picks circulars and the sock on the right I knitted with my 3.0 mm Addi Turbo needles as my Knit Picks needles did not turn up. I'm surprised at the difference between these two socks with only 0.25 mm needle size diameter between them. It appears that I have 8 sts per inch with my 3.0 mm needles. I think a tighter gauge would make a better sock, but that would take longer and I will want to get these into the mail as quickly as possible. Maria has high hopes for my winning this contest, though I did explain to her that a large part of it will be the luck of the draw. Sounds like you're getting ready for the competition. I hope you do well and more importantly have fun with the project. We're cheering for you from the sidelines! Those mini socks are adorable and I love the colors! The mini socks are so cute. Good luck in the contest.